It might resemble Sarah Polley’s directorial debut Away from Her on its surface, but Amour, winner of the Palme d’or at last year’s Cannes Film Festival, is a rarity among films. Amour lacks the same catharsis of Polley’s film, yet director Michael Haneke (The White Ribbon) seems to have a different objective. While Away from Her might have encouraged its audience to celebrate undying love, Haneke implores his viewers to look death in the face and watch it do its work as they sit powerless in their seats and eat their popcorn. Amour might be one of the most difficult films that a movie buff will ever have to sit through, but it’s also one of the most immediately rewarding and thought-provoking film experiences. Haneke drops the viewer into the final stage of the marriage of Georges and Anne Laurent, played by Jean-Louis Trintignant and Oscar-nominee Emmanuelle Riva. Georges and Anne are a pair of well-to-do retired music teachers. They’re cultured people, as their Paris apartment, fortified with bookshelves and artwork, suggests. 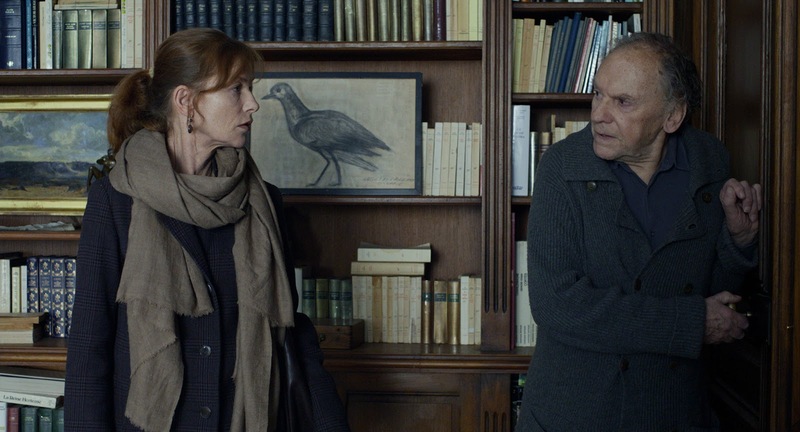 Trintignant and Riva give exceptional performances as the aging couple. Riva is especially good in a mostly physical performance—she spends much of the film bedridden—and shows the light slowly fading away from her character as Anne gradually chooses to stop clinging to life. Haneke veteran Isabelle Huppert also gives a strong supporting turn as Georges and Anne’s daughter, Eva. Eva takes the most dramatic reaction to Anne’s health, and her commonplace response to death offers a rare access point for one to interrogate what the film seems to be doing with its near-sterile portrait of life and death. Observing Georges and Anne primarily through a stationary camera, lensed beautifully by DP Darius Khondji (Midnight in Paris), Amour presents the Laurents’ marriage for one to watch like an intrusive fly on the wall. When Anne suffers a stroke one morning at breakfast, the disquieting long takes of Amour become almost unbearably uncomfortable. “Watch death work,” the film seems to say. Death, a subject that is frequently hidden from squeamish society, receives a near clinical analysis as Georges cares for Anne during the deterioration of her final days. Not too early on in the film does Anne say with the utmost clarity—and without a shred of romanticism—that there is no point for her to go on living. Frank and unsentimental is the approach that Haneke takes as he makes Georges confront the inevitability of Anne’s death. As one witnesses Anne’s declining health through Haneke’s cold observational style, one can only see the truth in her provocative statement. There comes a point when it seems cruel to force Anne to keep on living. Georges, at some point, should let his wife die if that is indeed her wish. Georges is confronted with mortality—both his and Anne’s—twice in Amour. A little pigeon visits the Laurents’ apartment twice during the film. The pigeon’s first visit comes around the midpoint of the film. Georges arrives home to find the window open and the bird walking about the apartment’s immaculate floors. Anne, now confined to her deathbed and tucked away in her bedroom, knows not of the pigeon’s intrusion. Georges hobbles after the bird and tries to shoo it out the window. This pigeon, however, has the spark of life: it has energy, it has mobility, and it can choose whether it stays or goes. The bird offers some welcome relief in Amour, whether it’s the funny image of a bird thwarting an old man or it’s the tangible sense of life that appears in this scene. The pigeon’s second appearance comes towards the end of the film. In what is arguably the film’s most enigmatic moment, Georges again chases the bird around the apartment. In the shot, which is perhaps the longest take in the film, Georges tries to catch the bird and it evades him. Georges, like Anne, isn’t what he used to be. Life is a flying bird; death is an old woman confined to her bed. 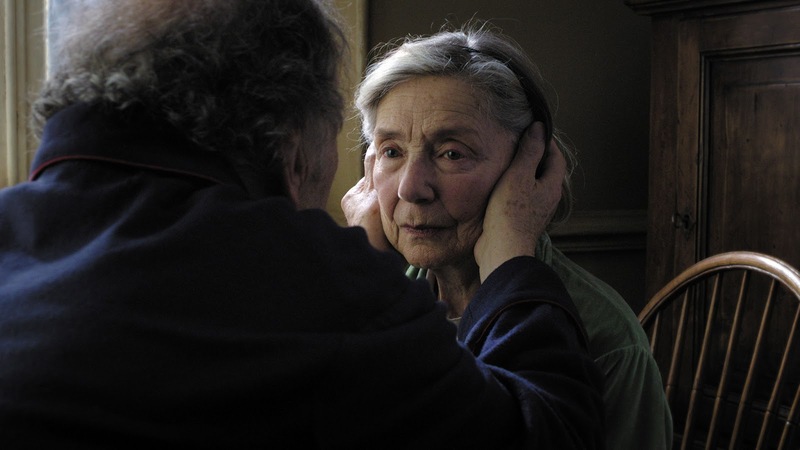 Amour, even at its most startling moments, arguably marks Haneke’s most accessible work to date. The digestibility of the film is surprising given the cold, detached style of his process. It’s alarming how little emotion the film evokes even though death lingers in every frame. (The initial framing device ensures that one is always aware of Anne’s fate.) However, the absence of emotional conflict is rather ingenious, for Amour avoids the obstruction that usually prevents people from talking about death. Death doesn’t need to be a passionate affair. It’s simply a fact of life. In some cases, then, taking a life is an act of murder. Other times, however, it’s simply an act of love. Amour screens in Ottawa at The ByTowne until February 20th.